Of course the match itself wasn’t hot and steamy, it was more tepid and tentative. It was actually the weather that was hot and steamy, probably only a little better than last year’s Supercoppa in Beijing. 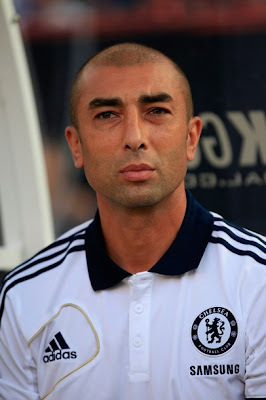 It seemed as though Chelsea struggled more under the conditions, despite having a much superior squad and Di Matteo definitely fielding a strong starting eleven. Milan’s starting lineup gave me severe nausea, specifically the back line. 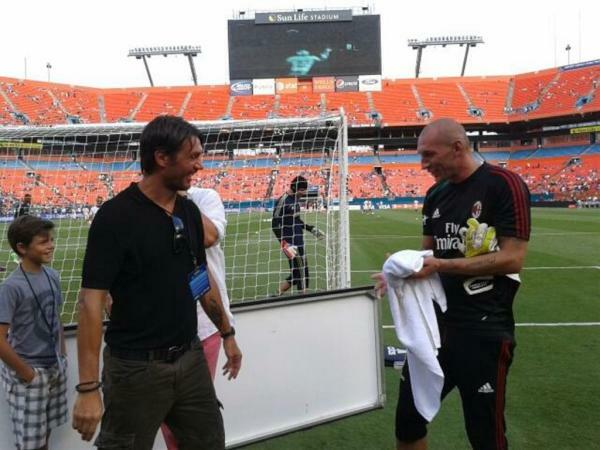 With Antonini, Bonera, Yepes, and Mesbah, I feared the worst. And I wasn’t all that disappointed, at least not when it came to fan favorites Antonini and Bonera. For me, Bonera defends about as well as one of those blow up things the teams train with, and the blowup things maintain possession better. In fact, if you randomly kick a ball at one of those things and it rebounds, it is more likely to find a Milan player than when Bonera tries to pass it. But I digress. If Di Matteo had the wealth of talent, Allegri proved that he can get more out of his players and tactics, at least on this night. With so few strikers available (or maybe in preparation for the return of Kaka,) our stubborn one-formation man went with a Christmas tree formation, the 4-3-2-1 that a player like Kaka thrives in. Whether it was a lack of trust for the Primavera strikers or a hint of things to come, Milan struggled with it for the first 25 minutes or so. But somewhere after Urby took that free kick in the 25th, Milan became a bit of a handful for Chelsea. In the 27th, Traoré hooked up with El Shaarawy with a nice 1-2 in which the former sent the ball just wide. Two minutes later, Flamini had a nice run on goal that was only stopped by Ivanovic. Then Boateng took a shot from distance, Urby Robinhoed™ one of the best chances of the game by that point, and El Shaarawy had an easy shot saved by Cech in the 36th. The second half started with a Chelsea who seemed determined to prove their worth, and right away, Bonera gave away a free kick with a typical dumb foul. But the most significant thing about this was that the ref broke out the magical field spray to paint the temporary line on the pitch for the players to stay behind. The magical part about it is that after not too long, it disappears. It is commonly used in North and South America, I don’t know if I could talk refs into running around with that can on their belts, but it was fun to see it used with two European teams. The next 15-20 minutes saw Chelsea attack more, and Amelia had more to do, too. But Milan hung in there and took their chances. After a boatload of substitutions which saw Nocerino, Montolivo, Abate, and Acerbi come on in the 62nd for Flamini, Ambrosini, Antonini, and Yepes, respectively, Marko Marin took a direct kick on Traoré’s most delicate parts in the 64th. To his credit, he got back in the game, not knowing whether or not he would ever father children again or sing anything other than soprano. But maybe it was this injury that inspired the goal, who knows? What we do know is that in the 68th, Urby dribbled forward, passed it to El Shaarawy, who drew Cech out and still had the poise and confidence to pass the ball over the fallen Cech across to Urby, who slotted it in easily past the defenders who’d come back to help out. 1-0 Milan. Once again, Urby showing that he is the kind of player who languished a bit in the shadows of the big players like Ibra, but when given space and opportunity, he can get the job done like the best of them. Not long after that, El Shaarawy, clearly not understanding the God-like status of a British hero like Frank Lampard, was trading shoves with him in the midfield like he had every right to. God bless that kid, he’s not intimidated by anyone’s ego. In the 74th, Valoti came on for Boateng, who had been visibly limping and hurting, let’s hope that was nothing serious. And then Constant, wearing Pirlo’s old number 21, came on for Traoré in the 80th. Not two minutes later, he had a great header to clear the ball on a Chelsea corner, well done. In the 85th, Bonera, wearing the captain’s armband, committed a terrible foul just inside the penalty area, but luckily the ref adjudicated it to be just outside of the box. This resulted in a free kick for Chelsea in a very dangerous spot. Luckily for Bonera, Hazard shanked it up over the crossbar. Armband? Stopping Torres? Don't care. Bonera, you are on my LIST. But this leads me to the end of my Bonera rant. Does he make some good stops sometimes? Yes. Like in the 91st, one on one with Torres all the way to the back line, he was effective. But so would one of those blowup things have been effective. The rest of the time, he’s out of position, making clumsy, horrible tackles which cost us, or conceding goals. He’s not going to get better, the man is 31 years old. So unless we need a really nice guy to help with the uniforms or towels or something, he should perhaps go to the Island of Lost Defensive Dreams, or maybe the MLS. Whatever positive contributions he makes, he’s always making gigantic gaffes, the likes of which often cost the team goals. Ganz came on for Urby in the 87th and had a couple of opportunities that perhaps experience would have converted, but he still looked great. I was disappointed that Prosenik didn’t also get at least a few minutes against his old team, but those are the breaks, I guess. We are not going to be competing for the Champions League with the starting lineup we fielded tonight. Even with the addition of our returned Euro players and Montolivo’s Milan debut subbing on, we are still not a complete squad. But we have a lot of players who are willing to work hard. And with the right reinforcements by the end of August, I have some hope that we won’t be constantly shamed this season, and maybe, just maybe, our grinta will make up for some of the quality we lost. It is a long season, and we have yet to escape the Injury Reaper™, but with a little luck and a lot of hard work, this team might just be able to hold its own in the league after all. Thank you, Miami!